Day 40 feels like an old friend. Back together again. Another Survivor Diet Challenge in the books! YaHoo! As much as I look forward to Day 40, it is always bitter-sweet. I finally hit my groove with this thing and now it is over. Or is it? . . . Duhn, duhn, duh! I have been thinking about different approaches to my Survivor Diet in terms of how long it should go, the types of rewards, the challenges to earn the rewards, etc. As an individual like myself finishes a Survivor Diet I learn many new skills and become more knowledgeable. It makes sense that each time I complete the Survivor Diet that I should strive each time to further challenge myself. Perhaps adding days to the duration of the diet each time it is completed will make it more challenging. Since this is my 6th time completing it, the addition of a day for each time would seem appropriate. If that's not enough for someone, feel free to add more - maybe an additional week for every completed SDC? Because I am feeling very good and I have not yet reached my desired weight of 175, I think I will semi-continue the SDC for an undetermined period of time. I will shoot for at least 6 more days based on the reasoning I previously listed - but I'm feeling like I can even go longer. I wrote 'semi-continue' because I don't think I am going to be so rigid and strict with the rules. Instead I will be 90% in Survivor Diet mode and 10% enjoy a couple treats here and there. I think that's only fair. I ended up not obtaining a few of my weekly rewards. I'm not sure if this is due to laziness, inability to competently demonstrate survivor skills, or indifference. But it didn't seem to bother me that I did not get these rewards. Not nearly as much as the first few times I took on the SDC. Perhaps I am either getting better at this or just getting more tolerant of the Survivor Diet foods. If I recall correctly, I believe I had a similar experience at the end of last year's diet. Interesting. I will have to ponder this a little more to see if I can figure out a trend or an explanation. I do remember a few years back when I had Megaburger as a weekly reward - oh, how I was looking forward to that. And I enjoyed it so much. This year I'm not really craving the red meat much at all. Strange. I can't really think of anything in particular that I am craving right now. Maybe an ice cream cone? I'll tell you one thing though - if I lost the ability to use butter and spices, everything would be different. I remember that first week or two this year very clearly. The use of a little butter and some spice makes EVERYTHING just a little better. I can make salt from sea water - and that's a huge help. But butter? I'm sure I could make it but I would have to figure that one out and I would probably need access to a cow. I'll put it on the list of things to consider. I didn't really have sweet until the addition of honey this year. And that was another HUGE boost. Why not make my own butter? We'll see. Here's a little recap of how Day 40 went today. I was off from work because it was Wednesday. Dad came up for a couple hours of fluke fishing. We had a really nice time and we were very successful coming home with about 6 keepers. We fished close to home which meant a very short boat ride in and out. The tide was almost completely low but despite the lack of current, the Wonder Rig did the trick once again. I would guess we caught over 20 fish all together but the best story is about the big one that got away. Or did it? I hooked up and began to reel my fish in. It started to feel pretty big so I asked Dad to get the net. While grabbing the net, he accidentally dropped it overboard into the water. It started to sink and he made a stretched out effort to try to save it. My fish started to really pull and I tried to keep it still in the water until Dad got the net. I watched as he struggled but eventually grabbed the net and got into position for my fish. Just as I was about to see the size of the fish it made a big surge backwards and broke my line - leaving me hookless and fishless! I just barely got a glimpse and sure enough it looked like the biggest fish of the year so far. Jokingly, I blamed my Dad for not being ready in time but in reality, my leader was probably chaffed a bit from previous fish and the drag on this reel was a little sticky. About 20 minutes later we repeated our drift over an area that was fishy and I hooked up again - to another big one. I took my time as this one was pulling line off my reel and fighting to get free. 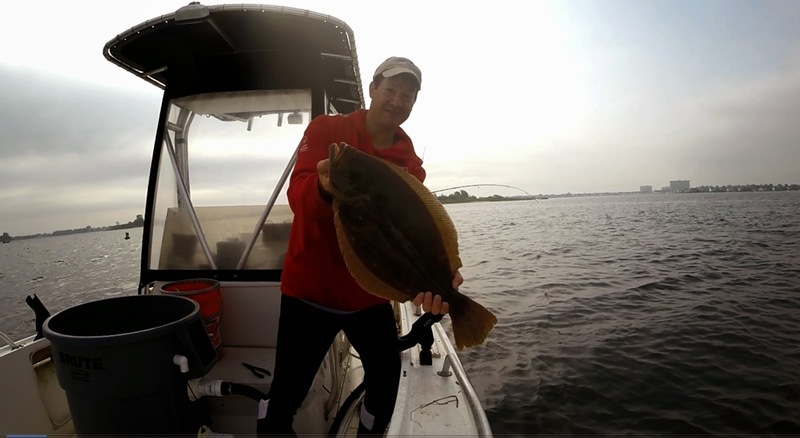 Dad was ready at the net and after a short battle we landed this really big fluke. It was 24.5 inches - the largest caught on my boat this year. Well, you're not going to believe this but as I was going to unhook this fish I reached into its mouth with my pliers and next to my hook was another hook embedded in the corner of his mouth. An identical hook to the one I was using - the same red, size 4, gamakatsu octopus hook from the Wonder Rig! It was the Big One that previously got away. I was amazed that this was caught twice in a 20 minute time frame. One mistake too many and this time it was coming home with us in the live well. The Big One that got away once, but not twice. I kept 3 fish and gave 3 to Dad to take home for dinner. My fish will sit on ice overnight and I will clean them tomorrow. Since I didn't eat anything prior to going fishing, I decided to go get my fasting blood work done at Lab Corp. It was around 10:30am and when I showed up without an appointment I was surprised that I walked right in. The morning rush was gone the whole process took about 15 minutes. In the past I have waited over an hour to get blood drawn so I'll have to remember that the time of day makes a big difference. I will probably get my results back next week and I will post the numbers to see how they compare to last year. My hope is that my cholesterol numbers are as low, or lower than the end of last year. I know the weight and blood pressure have stabilized. I'll just have to wait for the cholesterol report. The rest of the day was somewhat uneventful with the usual food items and some spicy honey popcorn for dessert. I went to the A&P with the kids and I was trying to think of the first thing I would like to eat tomorrow as a 'free man.' I decided that I would treat myself with a favorite piece of chocolate - Lindt Chili Chocolate - a hot, spicy chocolate that neither of my kids like at all! That will ensure that the chocolate bar will last at least a day or two. I am determined to not go overboard after this diet is over. Little treats here and there and meals in moderation. That will be the key to long term success. Moderation. This is a term that many people are just not familiar with.